Grape Ivy is a vigorous, evergreen vine with handsome, glossy compound leaves, each bearing 3 leaflets. Young leaves are fuzzy, giving them a silvery sheen. It's extremely adaptable to indoor conditions and makes an easy house plant. Pot ivy in a hanging basket to show off its beautiful trailing foliage. Large ivy plants can be trained up a trellis or moss pole. Its sturdy vines will scramble up any support, climbing and clinging with its curling tendrils. Pinch and prune. Growing tips are tender and can be pinched off with your fingernails. Regular pinching will keep your grape ivy plant compact and bushy. Don't toss out those stem tips either. You can propagate them for more plants. Control the plant's size by pruning every spring. Always cut at a 45° angle above a leaf node (the place where a leaf attaches to the stem). If a lower stem becomes bare, don't be afraid to cut it back at the base. Repot in spring every couple years or when roots fill the pot. Use one with drainage holes to prevent soggy soil and root rot. Grape ivy doesn't go dormant in the winter, but growth slows down. One of the common problems with ivy plant care is overwatering. Allow soil to dry out a bit between waterings in winter and stop fertilizing until spring. Grape ivy is in the Vitaceae family along with Vitis vinifera -- the much-cultivated vines grown for grapes, wine, and preserves. You'll find these types of ivy house plants for sale in spring and summer in garden centers and some online nursery sites. C.r. 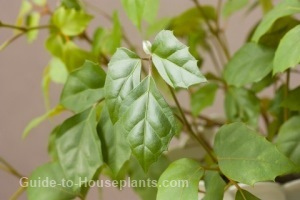 'Ellen Danica' is a popular variety, also called Oak Leaf Ivy for its deeply lobed leaves. 'Mandiana Compacta' is dwarf and compact, making it easy to train on a small trellis. Kangaroo Vine (C. antarctica) is an Australian native with single pointed, toothed leaves. Height: Size varies with variety. Some plants will climb up to 6 ft (1.8 m) or more with support. You can keep it to 2 ft (60 cm) with pruning. Grape ivy bonsai tree stays small. Light: Moderate to bright light. Protect your plant from direct sun, which can cause brown scorch marks on the leaves. Water: Water generously throughout the growing season, keeping the soil evenly moist. Water less in winter, allowing the top 1 inch (2.5 cm) of soil to dry between waterings. Shriveled leaves that fall off are a sign the soil is either too wet or too dry. Humidity: Grape ivies like relative humidity near 40-60%. Brown leaf tips are sometimes caused by dry air. Using a humidity tray can help, but give your ivy plant good air circulation to prevent powdery mildew. Temperature: Warm in spring and summer (65-80°F/18-27°C). Slightly cooler in fall and winter (50-70°F/10-21°C). Soil: Peat moss-based potting mix or African violet potting mix. Propagation: Take 3-4 in (7.5-10 cm) stem tip cuttings in late spring. Strip off the lower leaves and dip cut ends in rooting hormone powder. Then insert cuttings in a 1:1 mixture of moist peat and perlite. Enclose the pot in a plastic bag to maintain humidity. Roots should grow in 6-8 weeks.